A fresh, healthy glow is one thing. Shine beyond your control is quite another! Hey, we've all been there -- those days where, no matter what you do, it seems you can't quite manage the sweat piling up on your face. 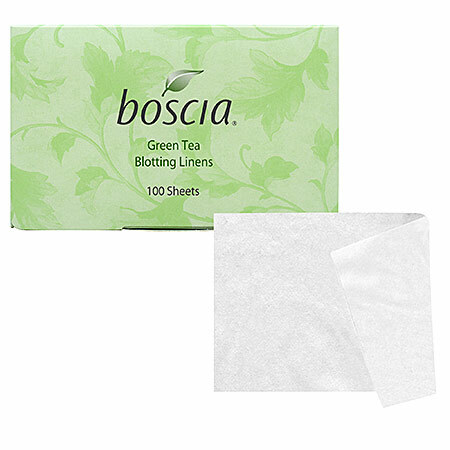 Lucky for all of us, Boscia offers blotting linens guaranteed to absorb excess oil. Take it from this beauty chick -- they really work! Before picture: skin with so much luster and gleam, I could be seen from a mile away. After picture: matte skin with that unsightly sheen banished to the curb! These handy linens come in sets of 100 and are available in six amazing scents: California Orange, Fresh, Lavender, Rose, Peppermint and Green Tea (this beauty chick's fave). Boscia Green Tea Blotting Linens are $10 for a pack of 100 at sephora.com.